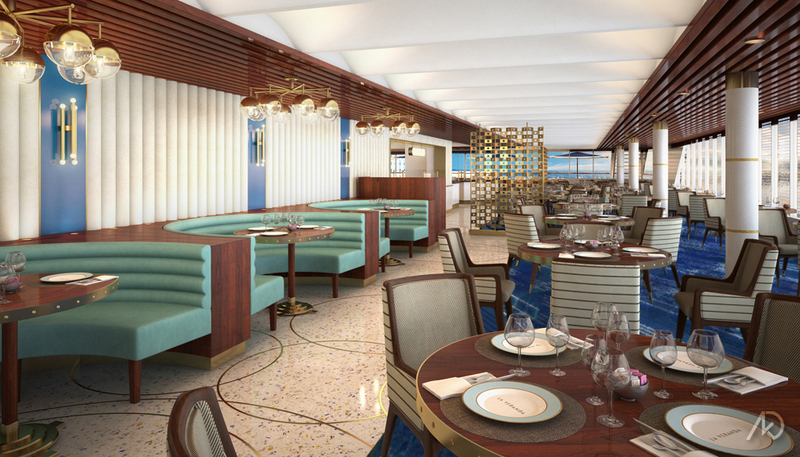 La Veranda is a restaurant which is located aboard a high-end cruise ship. 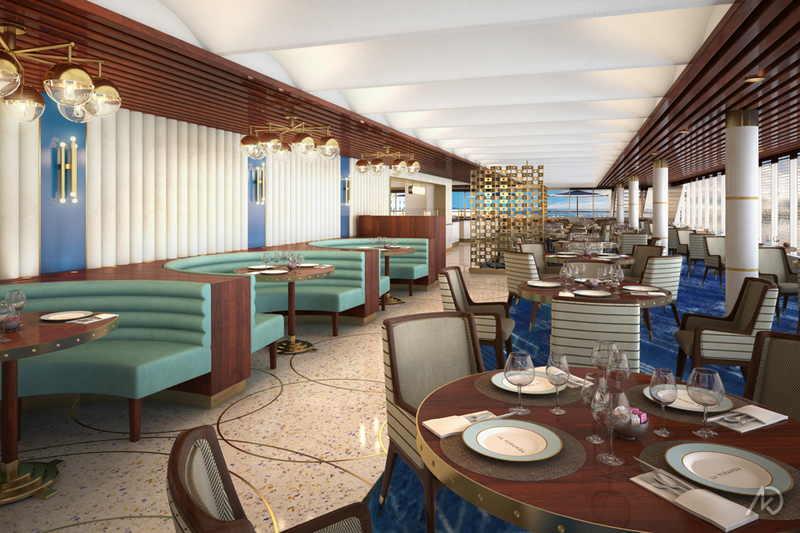 La Veranda will be one of its casual dining areas. The restaurant is made-up of an interior dining room and an exterior deck dining area. During lunch hours the restaurant remains casual. During the evening dinner hours, the restaurant transforms into a more formal dining space. During lunch hours the interior has an accessible buffet. During the evening dinner hours the buffet area is closed off with brass screens and waiter service is added. This project was completed as a schematic design exercise, so the design was evolving as the images were being produced. 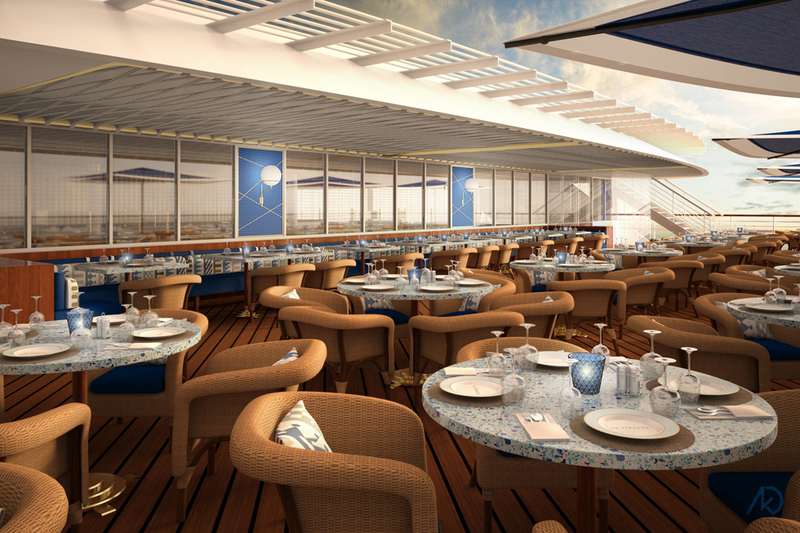 This 3d illustration shows the early design for the exterior deck dining area. There are a few banquette seats, but most of the seating is loose cafe tables with rattan seats. A great deal of thought was given to the overall branding of La Veranda. The blue hues seen in the plates, umbrellas, wall tile, and candle holder are all part of the branding package. The interior dining room shows the large banquettes as well as the loose cafe seating. Behind the brass screen one can see a tiny bit of the buffet serving counters as well as the exterior dining area (the umbrellas). Multiple options of this view was created so the client could see how the space would transform during the dinner hours.